Pack and Store Portable Storage Toronto has been providing secure and convenient portable self storage in Toronto and across the GTA since 2002. Our Toronto Self Storage service is the next generation of portable storage for mini storage users in the Greater Toronto Area. The Pack & Store Self Storage Toronto storage container is engineered and constructed of sturdy wood framing (2x4s & 2x6s). The floor and top are ¾” plywood, and the walls are 5/8” wood. Wood is by far the superior building material for a portable storage container. There is no risk of condensation (moisture damage), and the wood will not conduct heat or cold. The wood is also superior because it will absorb shock and jarring in the lifting, handling and truck transportation. Portable storage containers are 5’ wide, 8’ long, and 7’ high – research indicates this is the size needed to accommodate an average room of household goods. The door is very user-friendly, 4’ wide and 7’ high. The locking device is steel, and, of course, you may use your own lock to secure the storage container or pack & store mini storage will deliver and sell you one. The Pack and Store portable storage container is weatherproofed (18ga. vinyl truck tarp, designed to fit securely) while travelling to and from your site. Our warehouses are all heated and ventilated. All of our container storage facilities have regular, contracted, pest inspection and control. Safe handling and transportation of the portable storage container is a high priority of Pack & Store. Our storage containers are NEVER tilted or angled (no tilt-bed trucks). The forklifts and trucks are designed to handle and transport the storage container with a minimum of shock or jarring. No other portable self-storage company in the GTA owns or operates this unique equipment! Unlike all of the competition, Pack & Store’s equipment design allows the portable storage containers to be placed at your door, in your front yard or backyard. The placement can be on paved surfaces, grass, gravel, dirt, or curbside. Once the portable container is delivered, you can load at your convenience, or contact information for packers/loaders is available upon request. Please note that Pack & Store portable storage insurance does not take effect until we lift the storage container(s) from your property. The mobile container is transported to our secure, heated/ventilated warehouse. You may access your storage container at our warehouse at no cost, simply by providing us with a minimum of 24 hours notice. Pack & Store Self Storage Toronto will return the portable storage container when notified, please call 5-10 days before needed. The “redelivery” of your portable storage container may be to a different address than the original pick-up. Please note all transportation is subject availability. Pack & Store has a complete inventory of moving boxes, tape, mattress and furniture covers, and many other moving supplies, including a great new moving and packing product called ‘easycrate’. Call 1-866-330-7225 for delivery details or Pack & Store mini storage can deliver these crates in the storage container. Simply stated, Pack & Store customers may fulfill their moving and portable storage needs without having to leave their residence or business – Pack at your place, and store at ours. A crucial part of Pack and Store Portable Storage’s makeup is the skills and experience of all the staff. They relay intelligent, helpful, and truthful information to portable storage users in Toronto every day, and they strive to offer flexibility to make an often stressful time, less so. Some people may use self-storage/moving 5-6 times in a lifetime. Pack & Store staff may accommodate that many self-storage/moving customers in one day! Our portable storage clients have come to expect a consistently high level of service from our staff. Pack & Store Self Storage Toronto is ever mindful of this and is regularly training staff, researching new products, and always seeking input from customers. For those clients undertaking long-distance moves, we are also pleased to offer shipping services of their rented self-storage containers shipped directly to other Canadian metropolitan areas, and then delivered to their new address within the destination area. We hope that you will allow us the opportunity to assist you with your storage and moving needs. Whether you are seeking a short term (one-day) storage solution or extra space for an indefinite period of time, Pack and Store portable storage will undoubtedly prove to be your most convenient storage option. Staff members are always available should you have any questions. See our website for contact information. You can also read our self storage customer reviews to learn more about our high level of customer satisfaction! 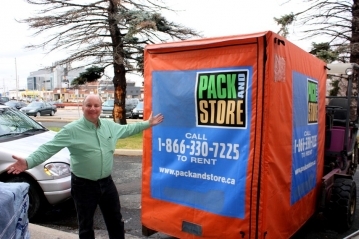 At Pack and Store Self Stoage Toronto, our goal is to offer the ultimate service in moving and portable storage for our customers in Toronto and across the GTA!